People just love Devil Ducks! He is always a great unique gift that people love to own. 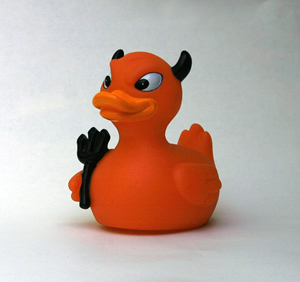 Well, now the premiere devil duck rubber ducky is here! We looked at all the devil ducks out there and just felt that we could come up with a devil duckie rubber duck that would be spectacular. We wanted a devil ducky that was both cute and mischievous at the same time. A lot of devil ducks on the market just didn’t have the look we wanted. Our cool devil ducky gift box alone is worth the price of admission. 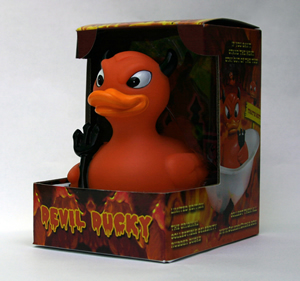 If you want a very special devil ducky rubber duck to bring a little fun and humor to your tub, not to mention a little fire, this is the one. As it says on the box, if you can’t stand the heat, stay out of the tub! This little devil ducky rubber duck is Smokin! !